There are some food-related things that I like to remain unchanged (...until I suddenly get tired of those items and want something completely different). These things include but are not limited to my weekday breakfast (Lucky Charms, if you must know, which replaced a years-long obsession with Honey Bunches of Oats with Almonds) and my before-bed treat (creamsicles for the win! )(previously a homemade caramel steamer, for which it's entirely too hot right now). My fiancé is kind of like that with his favorite chocolate chip cookies (even though we all know that one batch of chocolate chip cookies is never identical to the last, even if the same recipe is used by the same cook in the same kitchen using the same equipment), except that his desire for these cookies has never wavered. 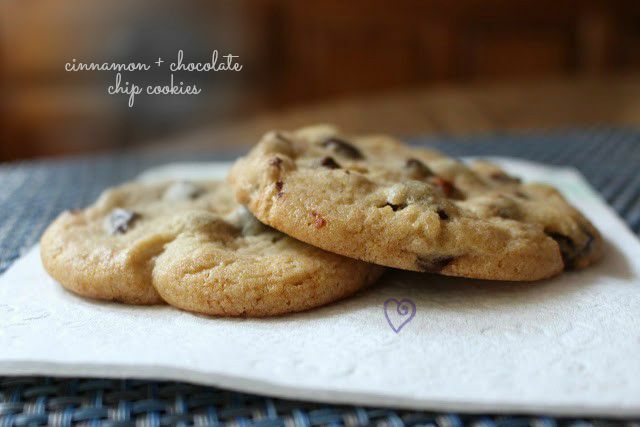 I boldly made a change to this last batch, adding cinnamon chips along with the requisite chocolate chips. I wasn't sure if he'd be able to tell immediately, but he did. The man knows his cookies. Beat in the eggs and vanilla (unless you're using powder, in which case you should add it with the flour in the next step) until light and fluffy; this will take a few minutes. Carefully beat in the flour, soda, and salt until uniformly mixed, then fold in all the morsels with a spatula. I am all about mixing things up AND I just happen to have some cinnamon chips in my baking pantry! Winning at life, right now. I love cinnamon in my hot chocolate, but never thought to put in standard chocolate chip cookies to spice things up a bit. Brilliant!!! Lovely cookies! They look really tempting. Chocomon :-)) I love the word, Grace. 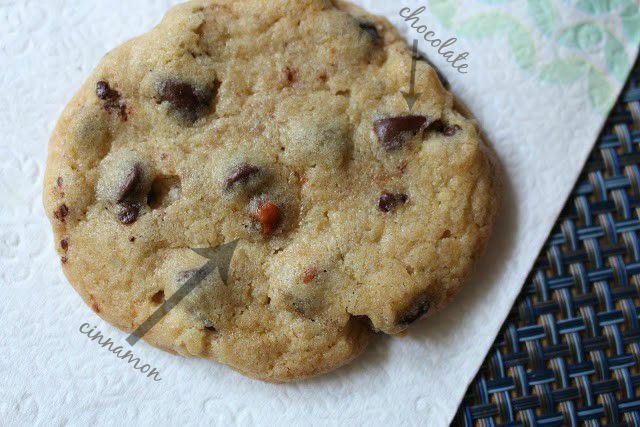 My husband would love those cookies as he loves CINNAMON! Always fun to see what the men are going to notice... or not notice! Kudos to yours for being so on top of his flavors! These do sound perfect! I love changing up old favorites sometimes too. The cookies look and sound drool worthy. Grace you always make the most delicious cookies!! I think it's hard to go wrong with chocolate chip cookies. They take well to various additions. Just that they're home-made and full of love makes them special each and every time. I am definitely a creature of habit (laugh). Still the cookies rock! I would enjoy them. The cinnamon chips are a really nice addition. Love it. P.S. Ireland is stunning. You will have a great time. There are no grumpy people in Ireland (laugh). The recipe belonged to the Grumpy Irish lady. I didn't even know there was such a thing as cinnamon chips! My hubby is the routine type of person who orders the same things in restaurants i, on the other hand take the risk and try different things. Sometimes it works, others it doesn't. So, I think I am going to try this version as well! Sounds like a fun variation on the tried and true! Whew! I was afraid you had figured out how to add tomatoes to chocolate chip cookies!